We’ve all heard the expression. A picture is worth a thousand words. But this particular photo puts me at a loss for any amount of words. Where media coverage phrases like “ongoing migrant crisis” fall feebly short, it bluntly conveys an ugly reality of just how desperate the situation facing many refugees has become. It’s one of several photographs that went viral earlier this week, hopefully shocking the world from complacency and ignorance concerning the plight of millions of people trying to escape the seemingly endless horrors of war in the Middle East. The photos and the dreadful circumstances they portray are a “stark testimony of an unfolding human tragedy that is playing out in Syria, Turkey, and Europe, often unwitnessed,” wrote Kim Murphy, a news editor at the Los Angeles Times. Well, now thanks to this heart wrenching photograph we are forced to witness a disturbing glimpse into a still frame of this unspeakable calamity, and we see more than a distant, inconsequential-to-us humanitarian crisis out of control. What we see is the appalling outcome of a fiberglass boat packed with 12 desperate people aboard capsizing off the coast of Turkey, after just minutes into their journey. Their destination – the Greek island of Kos, only 2.5 miles away. An estimated 2,000 people are making the same short but dangerously rough sea crossing every day. But these folks, including three-year-old Aylan Kurdi, his five-year-old brother and their mother, all perished in an effort to escape the hell on earth that is now Syria, drowning instead in the Mediterranean, ironically their hoped for passageway to freedom and a new life in the West. 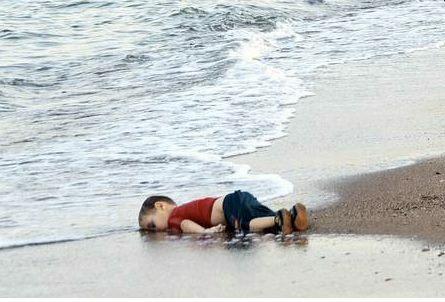 What we see is little Aylan, washed ashore on the beach, like debris cast off by a careless humanity. When power hungry men time and time again rationalize the insane depravity of bludgeoning the life out of each other, either with clubs or swords as in centuries past, or with the far more sophisticated and effective modern weaponry of our age, we all suffer. The bitter vintage of warfare is also drunk far beyond the blood soaked battlefield. The grim harvest of brutality spares neither mothers nor their children, and in this case, the iron scythe of death too soon struck down an innocent Kurdish family hoping for a new life beyond the grip of an insatiable monster known as terrorism. Rest in peace, Aylan. You are finally free. Free indeed. Words do not describe from my lips the outcry of my heart in response to the precious lifeless bodies all over the world due to man’s selfish inhumanity to man that only pictures can show. When will it end? Until the Jesus the Messiah comes back or until we stand up for what is right and pray without ceasing!